Jim is the Director of the Office of Corporate Engagement, where he provides industry leaders access to the university’s talent, research, and resources. 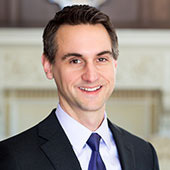 He coordinates team activities, works on high impact projects between companies and the University and serves as the point person on activities with Northwestern University Research Centers. In coordination with partners across multiple schools and campuses, the Corporate Engagement team strives to ensure a company’s involvement with Northwestern is strategic, streamlined, and supportive of company and university goals. Prior to Corporate Engagement, Jim held roles at the University focused on commercialization and entrepreneurship. He holds an MS in Biotechnology and a BA in Biology from Northwestern University.